Do you ever have one of those moments when you realise that you're gathering quite the stash of new beauty products? Since I've recently done just that I have done just that I thought I'd pop together a little post showing the new additions to my make-up bag which I've bought over recent weeks but I thought I'd do this post a little bit differently and share my first impressions too. L'Oreal False Lash X Fiber Mascara is a dual ended mascara, with one end containing 'Voluminous Black Primer' and the other containing 'Lengthening Fibers'. I've been using this mascara for a couple of weeks now and I really like it. It gives my lashes volume without making them appear clumpy (which is something I have struggled with when I've used similar products). Now I don't always have the time to apply both products on a morning (the extra time in bed is that bit more appealing..) but for my everyday look I've found that just using the primer works well. My Kat Von D Lock It Foundation is starting to run low so I purchased L’Oreal Infallible Total Cover Foundation in the shade '10 Porcelain' which I'd hoped might be a good everyday foundation option. The shade is a really good match for my skin but unfortunately I've not been overly impressed with the wear time, by late afternoon I've found that the product has started to look patchy on my skin.. not really a look that's working for me. My skin is pretty troublesome at the moment so when I saw that Nip+Fab Glycolic Fix Extreme pads were on offer I thought I would give them a go. So far I'm really liking this product, although it's too early to say whether using them is improving my skin but I might do a full review once I've tried them for a bit longer. When it comes to concealer I usually purchase Collection Lasting Perfection but I bought a Collection Cover Up Stick on a whim on a recent trip to Superdrug. I went for the shade 'Natural Beige' which is a good shade match with my Kat Von D foundation. Whilst applying this product is easy, I've found that blending it out can be a little bit more tricky. The concealer provides quite a light coverage which isn't always enough for me, but for £2 it's handy to pop into my work bag for a break time top up. As much as I love a pamper with a face mask I'm not a big fan of the mess that some face masks create. This is why I'm very pleased to see that sheet masks are finally making a wave here in the UK. 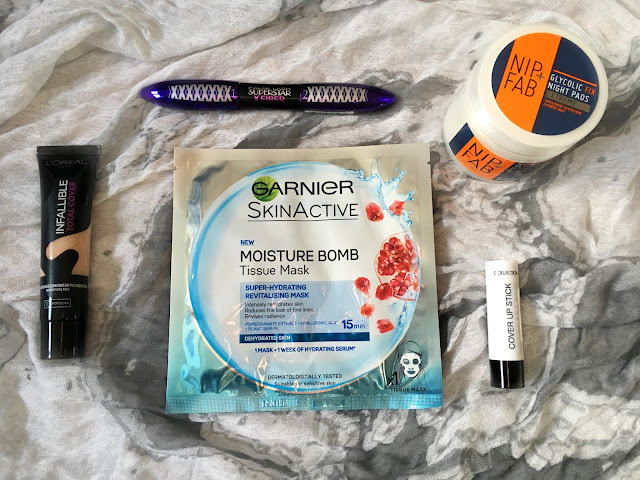 I've been really impressed with the Garnier Moisture Bomb Tissue Mask which contains plenty of product and gives my winter skin some much needed hydration.